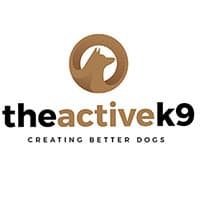 At The Active K9, we specialize in dog obedience training. This kind of dog training requires the dog look to the owner or handler for guidance in certain situations, as well as general obedience of given commands. We get a shift in attitude with the dogs we train, where they will look to us for permission instead of doing things like bolting out doors or getting out of a sit. We start this training by instituting rules and structure in the dog’s daily life. We do things like having the dog wait at thresholds (doors, gates, etc.) without being asked. This includes the crate door, and when we introduce a dog to the crating exercise, it’s just automatically added. Right then and there we get the dog looking at us with a new respect – and this lays a great foundation for doing dog obedience training, because the dog looks at us as more important in his life and listens to us a little more closely! Once we do start the actual dog obedience training – the Sit, Down, Place, Come/Here – we work with the dog and any limitations the dog has to get the best results possible. We use the dog’s daily food to provide motivation and reward for working with us. If our normal training session is 45 minutes long, and this dog is mentally tired after 15 minutes, we’ll give him time to rest instead of forcing things. We can always come back to a lesson after a few hours and work with a fresh, willing dog! If a dog is not interested in working for food, we will try a toy (though often anxious dogs will want neither). 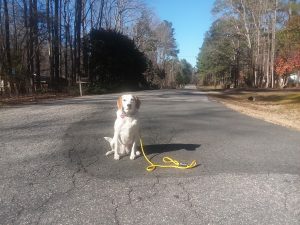 If neither of those items are of interest, we will do some basic pressure and release with the leash, giving the dog time to get to know us a bit, then let them rest and come back and try again after a bit. Each dog is different, learns differently and at different paces. In the end, however, we want a dog that is obedience trained and will do what we ask with a willing attitude, regardless of those differences. And that means that we have to approach our dog obedience training a little differently with each dog. If you are interested in having your dog trained at TAK9, contact us about our dog obedience training. We’d love to work with you! For more training tips, how-to videos, and dog training updates, follow us on Facebook!